It’s been a while since my last post, but I’ve been trying to sort through a thing or twelve. In my last post, I made a grandiose vow that I would do some form of exercise every day last week. Out of the 7 days, I did some form of exercise for three of those days. *sigh* Yes, I know. Apparently, I had it in my mind that this blog was going to solve all of my food and lack of exercise issues, but alas, it’s deeper than that. However, I have been doing well food-wise. Jason and I haven’t eaten out nearly as much as we were, and I have been able to experiment and make some wonderful dishes that I will share with you. 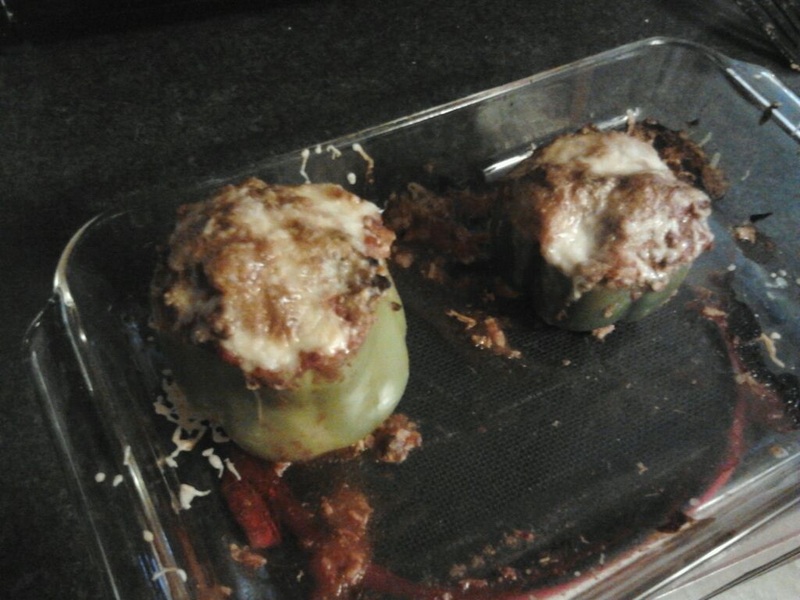 One of my favorites was a stuffed pepper dish that I made. I used free-range beef (we split a 1/4 of a cow with my in-laws every year), brown rice, tomato sauce (or tomato juice, if you’re in a pinch), onion and skim milk mozzarella cheese. I was supposed to add corn, but I forgot it. Anyhoo, these turned out FANTASTIC!! And they were filling enough that we didn’t need a side dish with them. Jason took a picture for me, and I didn’t know he was going to, so the picture isn’t “pretty”, but you get the idea. Ain’t it purdy?? Here is the link to that one: http://www.ultimatedanielfast.com/celebrate-the-blogs-birthday-with-a-piece-of-pie/ Hers looks better than mine, but I felt it wasn’t bad for my first go! 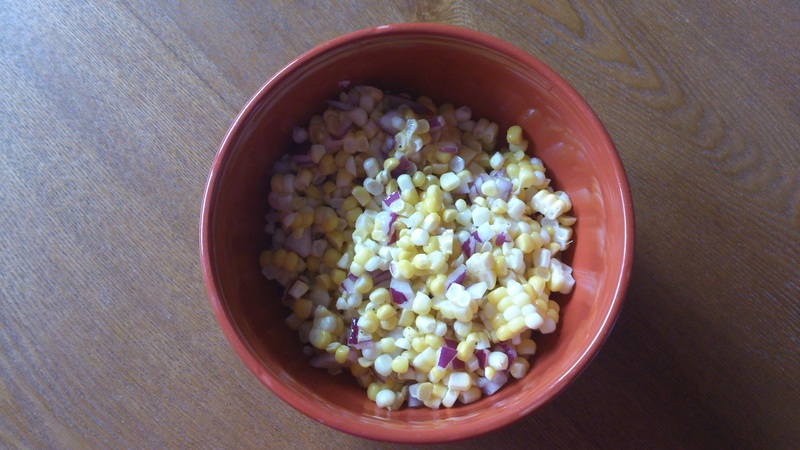 Another recipe I tried was fresh corn salad. I found this recipe in one of my Daniel Fast books. It says to use corn on the cob that you’ve cooked, which in this next picture, I did. But I’ve made it since then, and I used canned (that was all I had at the time). I think when I make it from now on, I’ll use the frozen, which is usually my veggie of choice for things like that. But that canned batch was just as outstanding as the fresh. I cut the recipe in half, so here’s what I did: 4 ears of corn (or two cans), 1/2 red onion chopped fine (or more or less depending on your taste), 2.5 tablespoons of cider vinegar, 2.5 tablespoons extra virgin olive oil, pepper to taste (I don’t like to add salt to anything, because there is enough in it already). The recipe calls for fresh cilantro, but I didn’t put any, because I didn’t have it. I’m doing this recipe from memory, but I think that was it for ingredients. Mix it all together and voila! This picture is my first batch with the fresh corn. Another great recipe I tried was strawberry jam. There are two ingredients in this amazing jam: Medjool dates and strawberries. That’s it! No sugar, no canning, no fuss no muss! I don’t have a picture for this one right now, but I’ll get one and post later. I also don’t have the recipe, but when I post the picture, I’ll add that, as well. I’ll get that later this evening. Dates are a wonder. I was really hesitant to even try to use them, because I thought it would be too complicated, but they are easy peasy! In our grocery store here (Hy-Vee), they are in the organic section. My only complaint about this amazing fruit is the cost. I bought a bag of them, and it was $23 and some change. They ain’t cheap! But they are oh so worth the price, as far as I’m concerned. They are so versatile, and they are EXTREMELY good for you! In fact, they are used in the crust of the afore mentioned pie. A lot of the recipes I’ve got lined up have dates in them; most are desserts. Which brings me to my next picture. A couple of nights ago, I made some cookies. Yes! Daniel fast friendly! The only thing I changed in the recipe was the raisins. 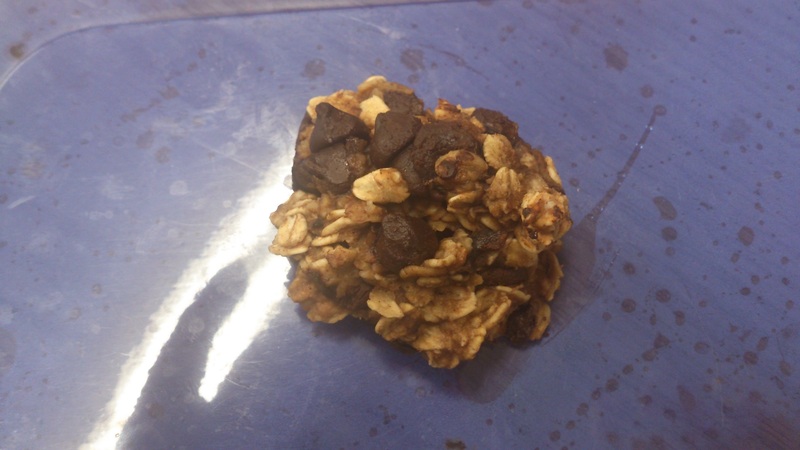 I omitted the raisins and used dark chocolate chips instead, which are good for you. The ingredients to these can be found on my Pinterest page. 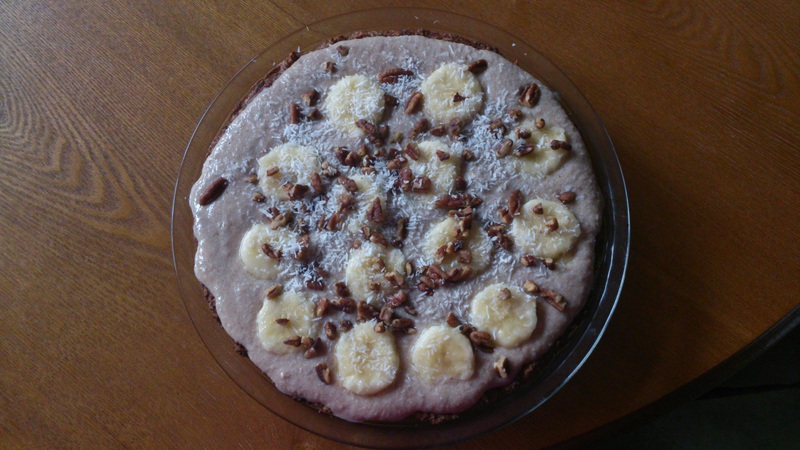 I have pinned the recipe in my Daniel Fast Desserts folder. It’s the one that has bananas and oatmeal in the ingredients. I don’t think I would have liked these if I hadn’t used the dark chocolate chips. They don’t have the texture of a regular cookie, so don’t expect them to be crunchy. They are good, though! And they are great for energy, which I inadvertently found out last night. I had a couple of them (they are small) around 7:30 or 8, and they gave me so much energy, I couldn’t fall asleep! Lesson learned! I spoke with a dear friend whom I work with, and we were talking about exercise. I told her how I don’t, and she explained to me how she does. I’ve been really frustrated with that aspect about myself, as of late. She gave me two very good ideas. She said exercise is part of her life. Period. Every morning, she packs her gym bag, puts it in her car, leaves work at 5 and goes straight to the gym. She doesn’t even go home. She’s like me in that aspect. If I were to leave work, go home and change, I’d never leave the house. So, that being said, today, I have packed a bag of workout clothes. They are sitting under my desk. Before I leave here, I am going to change and head out to my favorite place to walk. I’m not even going home. I have to kick this laziness once and for all. Her second bit of advice is to set a goal. The goal that she and I have set is we are going to run a 5k together in October. That gives me plenty of time to train. In fact, she is a personal trainer, and the gym where she trains has a 10 week program with kickboxing and weight training. The next one starts toward the end of September, so I’m going to sign up for that, too. I know I will fall in love with exercising, but it’s the getting there that’s been so tough for me. But you know what? God’s grace is sufficient for me. And He has all the grace I need. All I gotta do is take it and receive it. I will never do this without Him, and I’m tired of trying (literally). So there you have it. I will post again soon with more recipes, photos and workout updates. Feel free to post recipes that you have tried and like, too! I’m a recipe fanatic, so bring it on! Be encouraged! You are blessed! 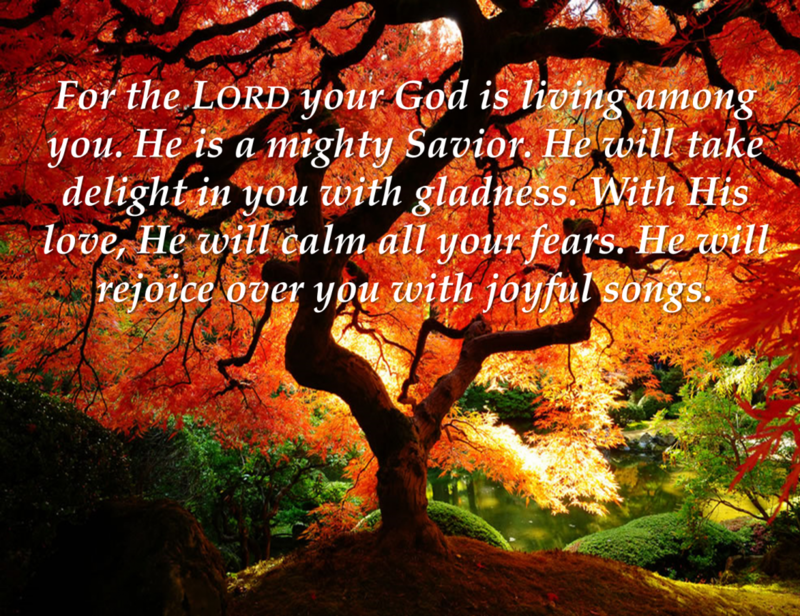 God loves you just as much as He loves Jesus! Hey my sweet girlie friend! I completely understand about the good one day, bad the next thing. Believe me! One thing I’ve learned is, I have to forgive myself DAILY! And I have to call on Jesus a LOT!! But He would have it no other way! I’ve got some GREAT recipes that I plan to put on here. You would be surprised at how creative you can become, once you get used to knowing what you should be eating. I highly recommend getting the What Would Jesus Eat book and cookbook by Dr. Don Colbert. I learned so much from him. I’ve gotten several of his books. Just today, I got some stuff in the mail that is supposed to really help with energy and how you feel. I plan to post some more sometime tomorrow (I want to tonight, but can’t promise). But I’m going to be throwing a lot of recipes on here, as I try them, but I will also do several that I’ve tried in the past that are great for you. You can do this!! WE can do ALL THINGS through Christ Who gives us strength!!!! Hang in there, my sweet sister! I love you!